The official Android emulator has a big disadvantage for regular users of Hyper-V: you cannot run the emulator accelerated when Hyper-V is enabled. You need to reboot your machine every time you wish to switch between using a Hyper-V based virtual machine and a hardware accelerated Android emulator. 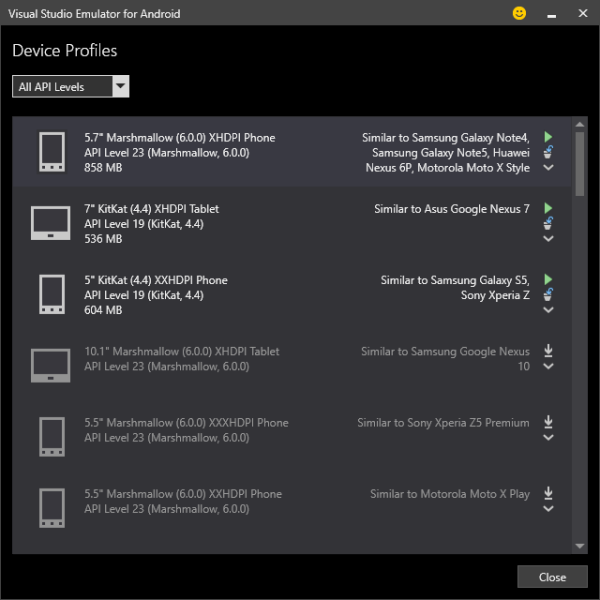 Fortunately, there is an alternative: Visual Studio Emulator for Android, which uses Hyper-V for hardware acceleration. However, it will launch the official Android emulator instead of the Visual Studio one and there are no flags available to change that. 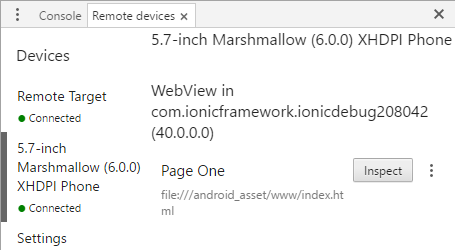 Since any running Android instance in Visual Studio emulator behaves as a connected physical Android device, this issue can be worked around easily enough. You will need to invoke Visual Studio Emulator for Android from Start menu beforehand and launch your desired device profile. As long as you don't have any actual Android phone connected to your computer, this will result in the application launching in the currently running Visual Studio Android emulator instance. You should however check its releases page afterwards because you will sometimes need to perform some manual changes to your project as well. Now you're ready to attach Chrome debugger to the application. 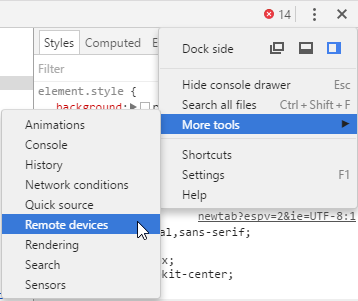 From the Chrome DevTools menu open More tools > Remote devices. Next, select the emulated device on the left, and click the Inspect button. 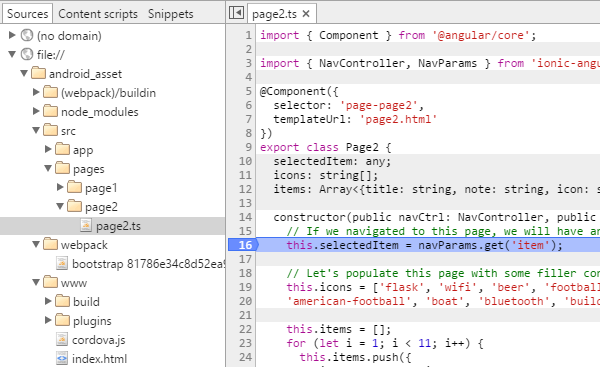 This will open a new DevTools window, attached to the application web view. In the Sources tab you can navigate to a TypeScript source file and set a breakpoint to stop the program execution when hit. 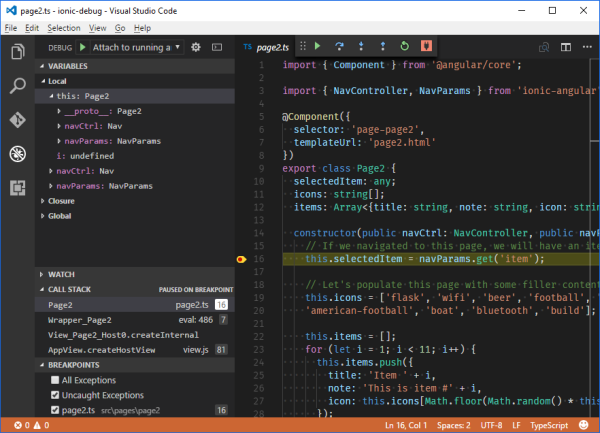 If you're using Visual Studio Code to develop your application, you should consider using it for debugging as well. To do that, you will need to have Cordova Tools extension installed. To configure the debugger, open the Debug sidebar, click the settings icon and select Cordova from the environment dropdown. You can delete the other configurations and rename this one to your liking. Launch the debug configuration when the application is running in the emulator to attach to it. You can now set breakpoints in source files to break the execution when they get hit.